← Snowed-out Super Bowl during Global Warming? We skeptics all new that some day that Mother Nature would win the global warming battle. The facts are facts and that scientific mistakes that were made would be discovered and corrected. The problem, became one of ego and money, which delayed the inevitable – the truth would win in the end, and the end is near. 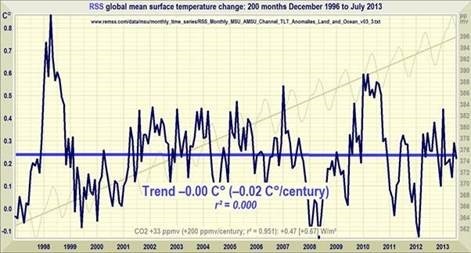 Global temperatures have not risen for 17 years. The pause now threatens to expose how much scientists sold their souls for cash and fame, warns emeritus professor Garth Paltridge, former chief research scientist with the CSIRO Division of Atmospheric Research.